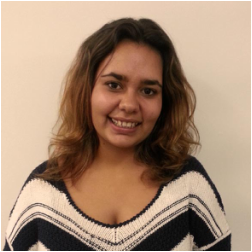 Mikaela Simpson is a broadcaster and journalist from CAAMA Radio, the Central Australian Aboriginal Media Association. She has been active at the Alice Springs radio station for the last two years, and is one of the producers of their flagship program Women's Business. The program is a celebration of women, empowering them on a local and national level, broadcasting strong aboriginal voices across the country. Mikaela is currently the Women's Representative, on the board of the CBAA (Community Broadcasting Association of Australia).